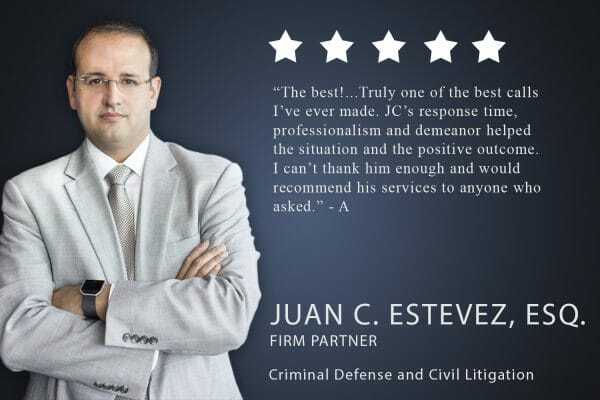 Juan C. Estevez “JC” is a Partner and founding member of Naum Estevez, PLLC. Mr. Estevez represents, advises, and counsels both individuals and corporations on a series of legal issues from contractual disputes to potential and ongoing civil litigations and even complex sensitive government criminal investigations. Mr. Estevez has the unique position in the firm of separating his law practice into two equal—but related—fields: criminal law and civil trial work. He can do this because of his extensive experience in both the local and federal courts of northern Virginia. Mr. Estevez’s practice covers two areas. First, drawing on experience as a current prosecutor for the City of Manassas Park and former assistant town attorney for the town of Vienna, Virginia, Mr. Estevez defends private individual clients in their most difficult criminal cases. He advises these clients on a host of matters, including: fraud investigations, government subpoenas, complex contract disputes, and agreements. Moreover, Mr. Estevez has extensive experience representing these clients at trial for criminal larceny, fraud, obstruction of justice and even tampering with government investigations. Additionally, Mr. Estevez also represents clients on less complex but equally serious traffic offenses in the area. Second, Mr. Estevez’s civil practice focuses on complex civil litigation matters. Primarily Mr. Estevez represents and counsels companies on large-scale breach of contract litigations and on all aspects of government investigations related to billable work done by a corporation and for the benefit of the U.S. Government and private companies alike. Mr. Estevez is a former associate with the law firm of Fluet, Huber + Hoang PLLC and Briglia, Hundley, Nuttall & Kay PLLC. During this time, Mr. Estevez represented numerous corporations and individuals in both civil litigations and criminal investigations, up to and including trial. Mr. Estevez attended Cornell University, graduating in 2003 with majors in Applied Economics, Corporate Finance and Latino Studies. Soon after college, Mr. Estevez went to work for the Mayor of the City of Miami before applying to and being accepted by George Mason School of Law. Mr. Estevez graduated law school in May of 2008, winning numerous national trial advocacy competitions and awards. Mr. Estevez was the 2008 National Criminal law moot court champion and the 2007-2008 American Bar Association Advocate of the Year for the northern Virginia area. For three years Mr. Estevez worked for Briglia Hundley Nuttall & Kay PLLC as a civil defense attorney and criminal defense lawyer. Mr. Estevez also spent considerable time as the town attorney for Vienna, Virginia where he prosecuted numerous cases in their General District Court. Mr. Estevez was born and raised to Cuban parents in Miami, Florida and he is fluent in Spanish.